One aspect of business travel is that you get exposed to unbrand products that you don’t buy yourself. Rather than the familiar names that you use at home, you’re trying some generically named, generically packaged product that some hotel purchasing agent bought in bulk to save a few bucks. Today I’m using “N’Joy” coffee creamer, rather than the Coffee-Mate we’ve got in the cabinet above our coffee maker, and “freshmint” toothpaste, rather than the tube of Colgate or Crest that we typically buy. I can report to those who are interested that “N’Joy” creamer has the same dusty consistency of Coffee-Mate as it’s poured, but it once it’s mixed with the coffee it doesn’t produce much of a rich, creamy taste like Coffee-Mate does. Instead, it just lightens the color of the coffee a bit, without having an appreciable impact on flavor. 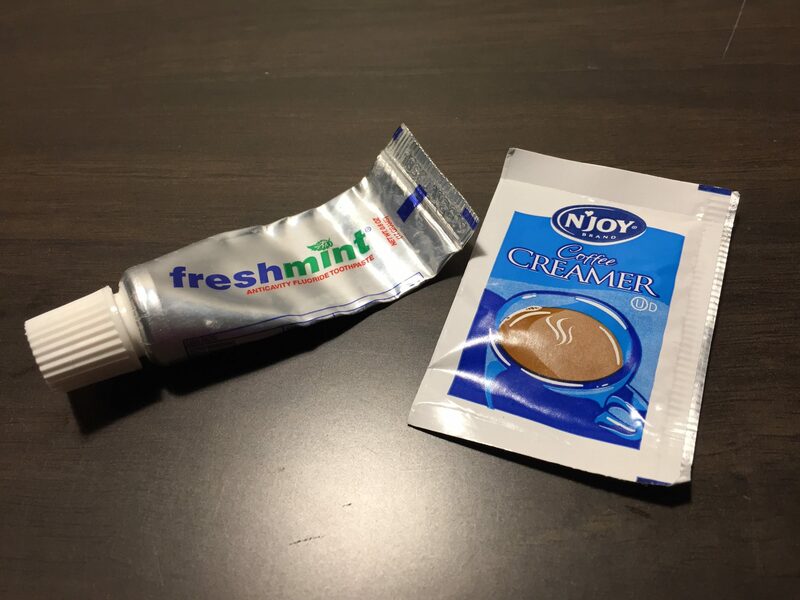 Perhaps it should be called “coffee lightener” instead of “coffee creamer.” As for the “freshmint” toothpaste — which I got at a hotel some time ago and have been carrying in my travel kit and using when I go on the road because I’m cheap and proud of it — it has a more gummy consistency coming out of the tube and going onto the toothbrush, sort of like spackling paste, but once you put it under running water it serves its intended purpose perfectly well and has a sufficiently minty taste to get rid of morning breath. As the photo above indicates, I’ve been happy enough with the “freshmint” to be nearing the end of the tube. When you’re on the road you’re on the road, and beggars can’t be choosers. Unless you’re going to lug around your own supply of household products, you’re in Unbrand Land, and you’ve just got to accept it.